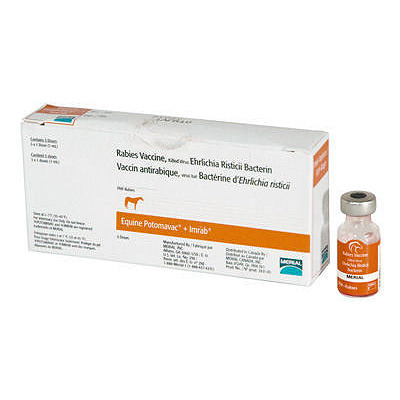 Recommended for the vaccination of healthy horses 3 months of age or older against disease caused by Rabies virus and as an aid in the prevention of Potomac Horse Fever caused by E. risticii. Dosage: 1 ml IM, repeat with a second dose of Potomavac + Imrab in 3 - 4 weeks. Revaccinate annually. Includes one free syringe with needle with each dose.